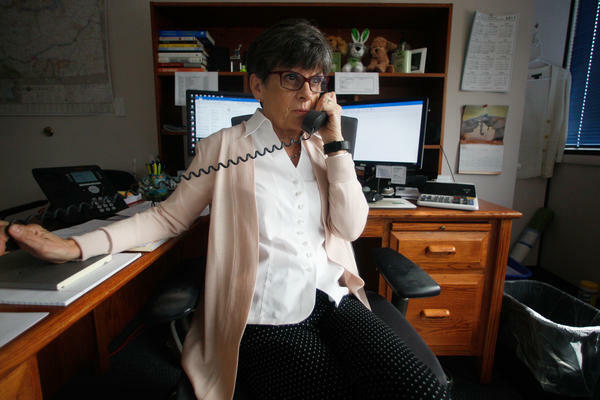 Marilyn Bartlett spent two years running Montana's employee health plan. She made better deals with hospitals and drug benefits managers and saved the plan from bankruptcy. Bartlett's license plate reflects her dedications to accounting. 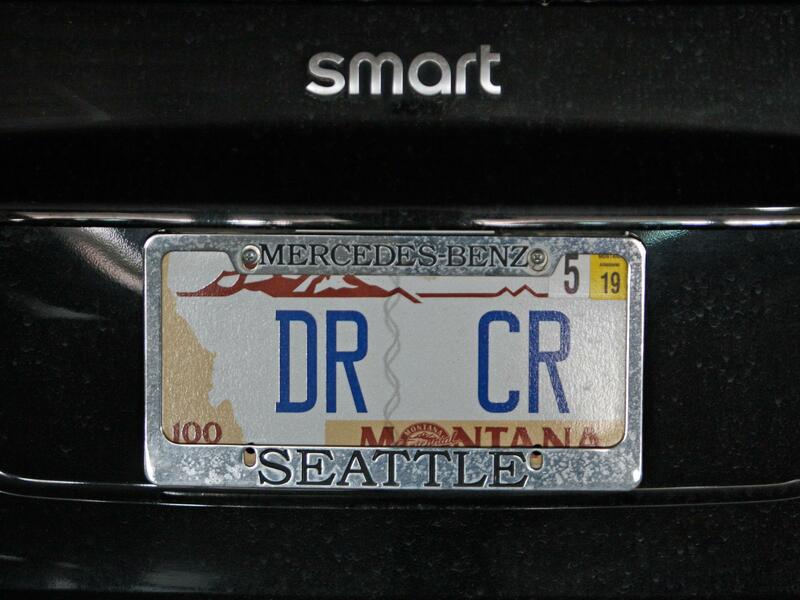 DR and CR are Latin abbreviations for "debit" and "credit" respectively. Marilyn Bartlett persuaded Montana's hospitals to commit to a new lower and more consistent pricing system. Bartlett walks through the Montana Statehouse. She held off hospital CEO and lobbyists' attempts to make an end run around her push for new pricing. Bartlett came with some unique qualifications. She had just spent 13 years on the insurance industry side, first as a controller for a Blue Cross Blue Shield plan, then as the chief financial officer for a company that administered benefits. She was a potent combination of irreverent and nerdy, a certified public accountant whose smart car's license plate reads "DR CR," the Latin abbreviations for "debit" and "credit." Most importantly, Bartlett understood something the state officials didn't: the side deals, kickbacks and lucrative clauses that industry players secretly build into medical costs. Everyone, she had observed, was profiting except the employers and workers paying the tab. The way health care works in America, most employers cede control of costs to their health insurers, the hospitals that treat their employees and the companies they pay to manage their benefits. The costs are a dense thicket that few employers feel equipped to hack through. So they don't. And so Bartlett pitched a bold strategy. Step 1: Tell the state's hospitals what the plan would pay. Take it or leave it. Step 2: Demand a full accounting from the company managing drug costs. If it won't reveal any side deals it had with drugmakers, replace it. As Bartlett laid out her plan that day in July 2014 in a conference room in Helena, Sheila Hogan, then-director of the state's Department of Administration, liked what she was hearing. They needed something radical. To her knowledge, no one had ever tried anything like this. Despite the money at stake, many employers have, wittingly or not, deferred to the industry. Decisions about health benefit plans are usually made by midlevel human resources managers who may not understand the forces in the medical industry operating against them. They're often advised by insurance brokers, who are traditionally funded by the industry. And they're trying to keep the peace for employees — who demand convenient access to the care they need. It's a recipe for inertia. No one wanted to stiff the hospitals, but this was ridiculous, Bartlett recalls thinking. She determined the new rate for all hospitals would be a little more than twice the Medicare rate — still a lucrative deal, but a good starting point to get prices under control. The contracts would also prohibit a practice called "balance billing," under which hospitals bill patients for whatever charges a health plan refuses to pay. "You're in or you're out"
Pharmacy benefit managers also rake in dollars through rebates paid by pharmaceutical companies. Most health plans would assume that because they're paying for the drugs, they should get any rebates. But pharmacy benefit managers often don't disclose the size of the rebate, which allows them to keep some or most of it for themselves. 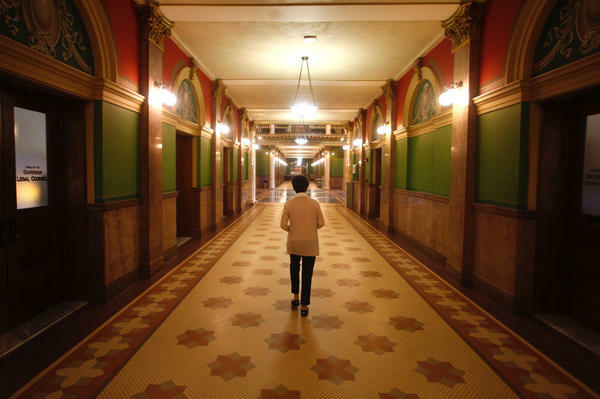 When Bartlett pressed, she discovered the state wasn't getting the full amount of its rebates. Bartlett says it helped that she was near the end of her career and didn't need to please people. "I'm 67, so I could give a s***," she says. "What are they going to do, fire me? I'm packin' a Medicare card." But Bartlett also has a side gig as a guru to other employers across the country seeking to pay less for their health benefits. Her advice boils down to pushing back. "You've got to get in there and do it," she says. MARSHALL ALLEN: Good morning, Steve. INSKEEP: Who is this woman? ALLEN: We're talking about a 68-year-old grandmother named Marilyn Bartlett. And Marilyn Bartlett took over the Montana employee benefit plan in 2014. And when she took over the plan, which covers about 30,000 state employees and their families, that plan was in deep trouble. It's self-funded, so the employer paid all the health care bills. And it was projected to lose about $50 million in the coming years and basically go broke. INSKEEP: So the classic situation here that people in all sorts of insurance arrangements face where they're basically told health care is really expensive, gets more expensive every year. And we're short of money. We need more from you. ALLEN: Exactly. And if people hadn't noticed, the cost of your health care benefits is rising. There's about 151 million of us who get our health care benefits through our employers. And part of the problem is our employers have been deferring to the medical industry when it comes to the cost of health care. And so the industry keeps raising the cost. And basically, those costs keep getting passed on to the workers. 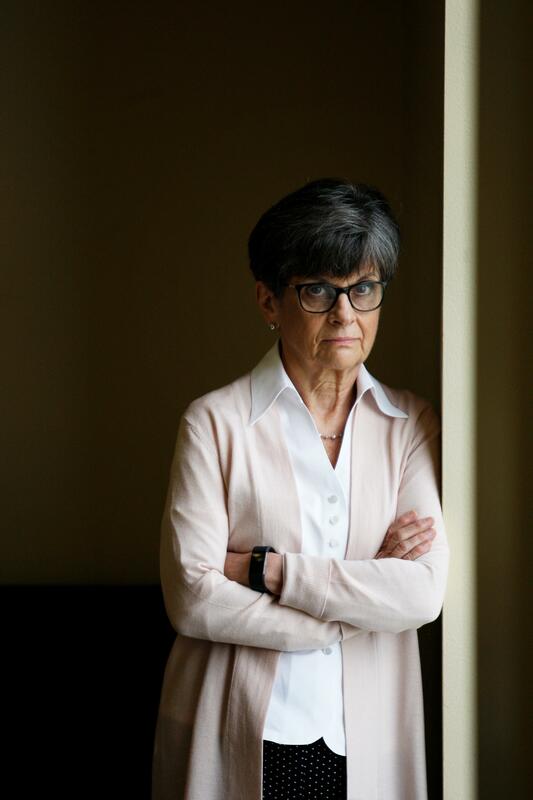 INSKEEP: What did Marilyn Bartlett do differently? ALLEN: She had spent 13 years working in the insurance industry, and so she knew a lot of the games. She was also kind of a math nerd who knew how to follow the money. And so working with her team, she compared what her plan paid each hospital in the state - the bigger hospitals - to what they were paid by Medicare. And Medicare publishes its prices. And so she could see that her health plan was paying hospitals in the state anywhere from two times what Medicare gets paid to five times what Medicare gets paid. INSKEEP: Wow. And so she said that was too much. ALLEN: It was too much. I mean, the plan was going broke. Her charge was to get things under control. And so she had to do some really hardball negotiating. And what she decided to do, which is kind of a revolutionary idea in the health care world, is she decided to set her own prices and set the plan's prices. Now in this case, she had some leverage. And actually, all employers have this leverage because the health care industry really does need our money. So she said, look; you hospitals that are at five times the Medicare rate, you're going to need to bring your prices down to about twice the Medicare rate. INSKEEP: I wonder if hospitals simply had to accept that. I'm thinking that in Montana, there can't be all that many hospitals. There surely would be a hospital that would just say, listen; our price is our price. ALLEN: It took some hardball negotiating. She threatened to go public with the price variation and expose the high-priced hospitals. She called in the union to campaign against a hospital that was holding out, and they had a whole campaign statewide. They sent hundreds of postcards and made phone calls to the hospital executives and leaders. And eventually, all the hospitals signed on. And the plan saved about a million dollars a month just from the reduced hospital prices. INSKEEP: Is there a lesson here for employers of all sizes that if they put in the time, they can get the leverage to hold down what is paid for hospital and other medical costs? ALLEN: Marilyn would say absolutely, yes. Her message really to employers is you need to push back. You need to read the fine print in your contracts. You need to demand to know where the money is going and why the costs are so high. Get an itemized explanation for all of the expenses. And when you do that, you know, you may need to - the smaller employers may need to join together with other small employers to increase their leverage. But they can bring down the prices. INSKEEP: Marshall Allen of ProPublica, thanks very much. ALLEN: Thanks so much, Steve. Transcript provided by NPR, Copyright NPR.